"The new SEAT Ateca plays a key role in our new brand strategy. The Ateca is kick-starting the largest product offensive in the history of SEAT." These were the words of SEAT Executive Committee Chairman Luca de Meo during the launch of SEAT's first SUV in 2016. 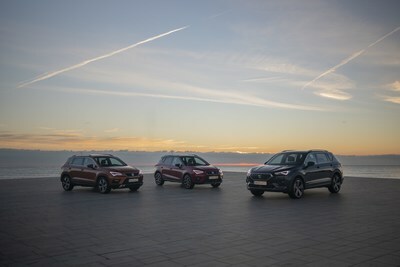 Two and a half years later his intentions have been fulfilled and SEAT now has three models in its SUV range, all sharing the same DNA but with their own distinct personality. Today they are on the road together for the first time in the city where they were created. -Design created in Barcelona: this is the deciding factor for 65% of customers who purchase an SUV. In the case of the SEAT models, they all have a common origin - Barcelona. "All three could only have been created in this city," according to SEAT design director Alejandro Mesonero-Romanos. With the elegance, sportiness and love for detail as shared characteristics, each model has its own features. 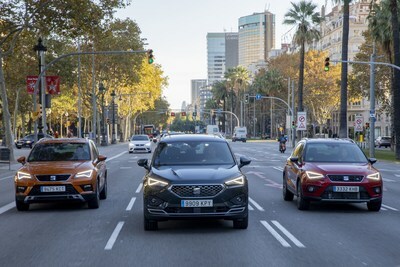 For example, the Arona boasts a "strong crossover character, with 68 possible colour combinations", the Ateca is distinguished by its "elegant silhouette" while the Tarraco "conveys its character thanks to the design of its front end, which points to what future SEAT models will look like." -Engines to suit all needs: with performance outputs ranging from the 95 hp of the Arona to the 190 hp of the Tarraco, the three SUVs offer a wide variety of engines to guarantee performance, efficiency and reliability. In addition, the Arona is the first model in its segment to offer a Compressed natural Gas (CNG) engine, while the Tarraco will benefit from a Plug-in Hybrid version. SEAT's largest SUV is "a masterpiece in terms of functionality and versatility" assures SEAT Vice-president for R&D Dr. Matthias Rabe. -Safety, the highest priority: Traffic Jam Assist, Lane Assist, ACC adaptive cruise control, emergency braking function… These are just a few of the state of the art safety assistants that are built into SEAT's SUVs and which show the brand's commitment to prioritising safety and making driving easier. Furthermore, the Tarraco raises the bar even higher by including pedestrian and cyclist recognition systems. 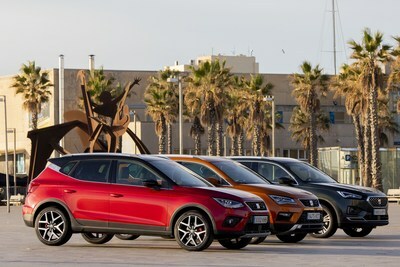 The SEAT Group employs more than 15,000 professionals and has three production centres - Barcelona, El Prat de Llobregat and Martorell, where it manufactures the highly successful Ibiza, Arona and Leon. Additionally, the company produces the Ateca and the Toledo in the Czech Republic, the Tarraco in Germany, the Alhambra in Portugal and the Mii in Slovakia.